Document Recognition and Retrieval (DRR) is a leading international conference for current developments in document recognition and retrieval research. The 21st Document Recognition and Retrieval Conference was held as part of SPIE Electronic Imaging, from Feb. 5-6, 2014 in San Francisco, California, USA. The conference venue and hotel was the Hilton San Francisco Union Square. The conference had oral and poster presentation sessions, along with invited talks by: Ray Smith and Ashok Popat (Google), on OCR for Google Books; and by Alexei A. Efros (UC Berkeley), on What makes Big Visual Data Hard? Papers presented at the conference have been published in the DRR Conference Proceedings. Rajiv Jain (Univ. 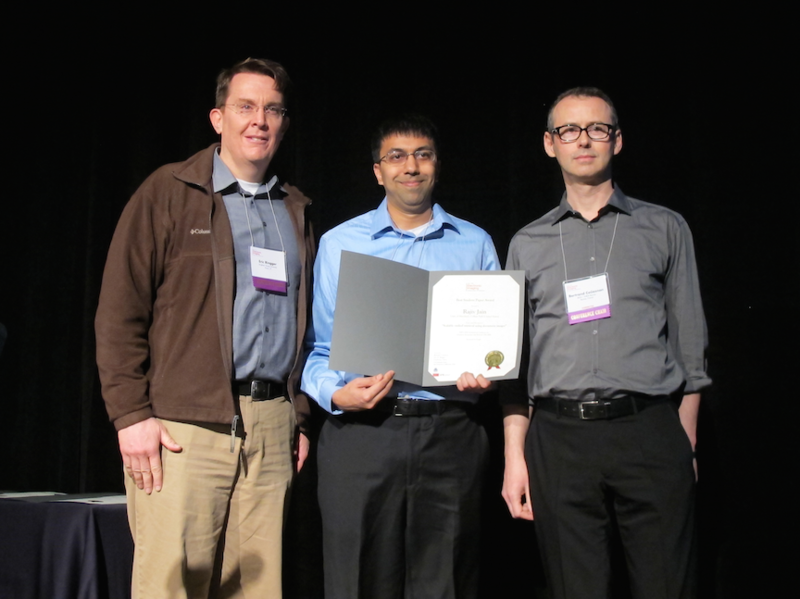 of Maryland, College Park) received the DRR 2014 Best Student Paper Award for the paper "Scalable ranked retrieval using document images". Our thanks go to Elisa Barney Smith, Laurence Likforman-Sulem and other Program Committee members who selected the winning paper. From left to right are Eric Ringger (DRR XXI Co-Chair), Rajiv Jain, and Bertrand Coüasnon (DRR XXI Co-Chair). We greatly appreciate Google's support of the Best Student Paper Award. Thank you to all for a very successful DRR XXI! "What makes Big Visual Data Hard?"